At Dwell, we celebrate designs that are made responsibly. Our assortment of sustainable designs proves that environmentally conscious products do not have to sacrifice great design. Check out some of our favorite sustainable products, including furniture, personal accessories, and even lighting. 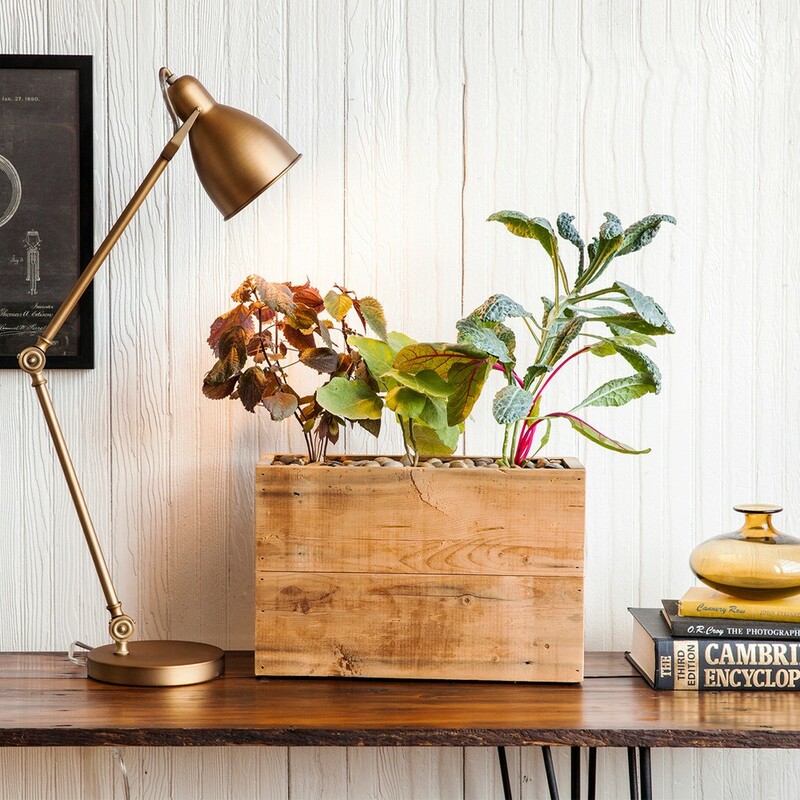 Modern Sprout’s planters were designed by Nick Behr and Sarah Burrows, two Chicago apartment dwellers who wanted to grow their own garden, but didn’t have the space. Struggling to maintain plants in their apartment, they tried hydroponic planters, which yielded results, but were expensive and unappealing to look at. As a result, they designed their own planter—a hydroponic, self-watering system that hides its mechanism beneath a reclaimed wood planter box. This sturdy stool is inspired by the delicate filigree of the Staghorn Cholla cactus. Designed by the architect and co-founder of Artecnica Enrico Bressan, the Kaktus Stool is a contradiction in form—lightweight aluminum gives the appearance of airiness and fragility, but is entirely weight-bearing. The Kaktus stool is made from 100% recycled aluminum and can be used as a seat or side table. When not in use, the stool appears sculptural and makes an artful accent in an interior space. French company Bacsac creates innovative products that can be used for a variety of purposes, indoors and out. Made of a double-walled, 100 percent recyclable geotextile fabric, the innovative trio planter maintains the balance between air, soil, and water. The planter can be used for flowers or vegetables, and is an excellent option for organizing a garden on a patio or deck. When not in use, the flexible, lightweight bag can easily be folded and stored, making the Trio Planter a more versatile option than traditional ceramic pots. The Vertical Tube Light is an unexpected light that blends recycled materials and innovative design details to create a truly distinctive light source. The light is comprised of recycled T8 fluorescent bulbs as diffusers, which work to emit a soft, warm light. The recycled bulbs are secured by a powder-coated white metal strap, furthering the industrial look of the light. With its Reclaimed Wood Desk Caddy, Peg and Awl takes repurposed, functional, retro, and beautiful elements to create a necessary desk accessory that is worthy of admiration. Crafted from reclaimed olde growth pine from antique floor joints salvaged from Philadelphia houses built in the 1800s, the caddy has a decidedly vintage look and feel, while also blending easily into contemporary interiors. The caddy is hand-rubbed with natural tung oil, which creates a water resistant and durable finish. Designed by Seth Eshelman in 2006, the Cain furniture series was conceived from a need for simple, accessible furniture. Ranging stools, benches, and chairs, the Cain Collection encompasses the Staach brand’s focus on sustainability in design and manufacturing. The wood used in each Cain Maple Stool comes directly from American mills and is then fabricated by hand with limited use of tools. The choice to reduce tool usage is a purposeful one—it helps achieve a higher level of sustainability by limiting the manufacturing carbon footprint. The artfully designed Soma Water Purifying System is an innovative product that reaches beyond the limits of other purifying systems. The all-natural Soma filters are made from coconut shells, silk, and a plant-based casing. These biodegradable filters decompose naturally in commercial composting centers, which greatly limits the amount of waste produced when they are thrown away. Instead of filtering into a plastic pitcher, Soma uses a handcrafted glass carafe that produces clean and crisp tasting water. Featuring an hourglass shape that is both attractive and functional—it makes pouring effortless—the Soma carafe is an elegant, smart design that is welcome wherever water is needed. Environmental protection blends with elegant design in the Kizara Maru Plate Set. Made from pine trees sourced from healthy sustainable forests in Japan, this set of eight disposable wooden plates is recyclable. Because of the specialized production process, no two plates are the same—each reveals its own intricate wood grain pattern for a distinctive place setting that will create a striking contrast with metal flatware at a dining room table, or will nicely complement an outdoor dining setting with its own natural look.